The work of Tobias Buckel is a type of painting, which is created slowly and meticulously and hence it is to be ingested the same way. Technically speaking the paint is applied in very thin layers, which literally constructs the painting one after the other. It is a patient practice that often requires the painter to start over, cover the entire surface, and use the discarded painting as a base for the new development of the work. Yet another act which emphasizes the constructional aspects of his methodology. The represented images are stripped of anecdotal or narrative elements underlining their state of undress: the result is what is essential to the representation. As a spectator one must detain in front of the work, taking the time to visually reconstruct what is in front of you. Rooted in figuration, Buckel carries out a process of stylization almost to the point of reaching abstraction. To this aim, often space appears from a nearly frontal point of view, in which the perspective plays a fundamental part as it combines different viewpoints at once. The virtuoso use of colour accentuates the result. We see those spaces from a lost “fourth wall” and the title of the show is a reference to that in a wordplay quoting the song “Stay Out Here” by The Knife. 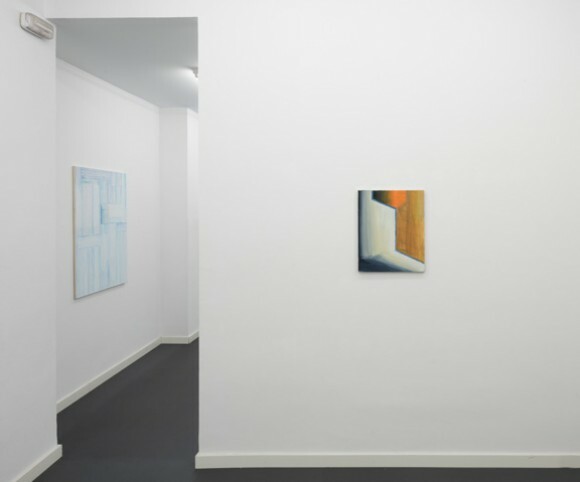 These are paintings that reproduce space: rooms, salons, windows, walls… which always originate in the experience of some sort of reality, that being literally what is before the eyes of the painter (the studio, the exhibition space) or spaces retained in his memory, or even recovered from photographs. Yet again, the act of stripping them bare of any ornamentation or detail gives us hints of the importance of the form and the structure. Simultaneously the relationship between the works within an exhibition context becomes imperative. The repetition, the variations, major or minor, all create a trace that contributes to the re-construction of the represented.